SNAPPY PREMIUM MARINE POLISH med PTEF® -It is not a wax! PTEF has many advantages over traditional waxes. PTEF creates a slippery hard surface the prevents dirt from sticking. Dirt runs off. We call this effect the “frying pan effect”. PTEF also protects up to 5 times longer than traditional waxes. This long time protection is a result of the binding power between PTEF and gelcoat. Snappy Polish even has extra UV protectors to prevent breakdown, oxidation and other negative environmental effects. 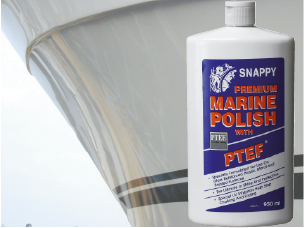 Lastly we would like to proclaim that Snappy Marine Polish with PTEF is very easy to apply.